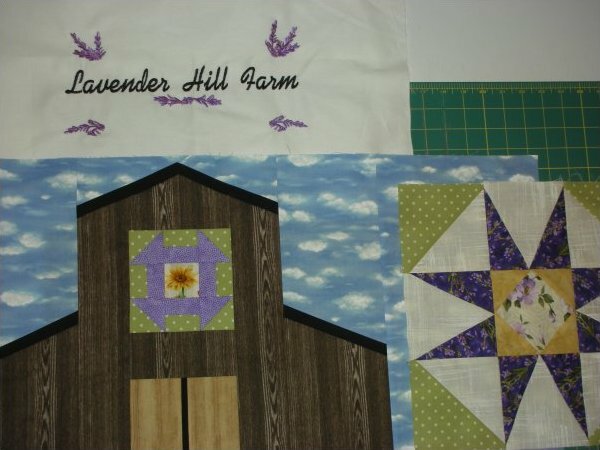 We love our lavender farms here in Western Washington and we love this quilt by Eleanor's sister, Judy. 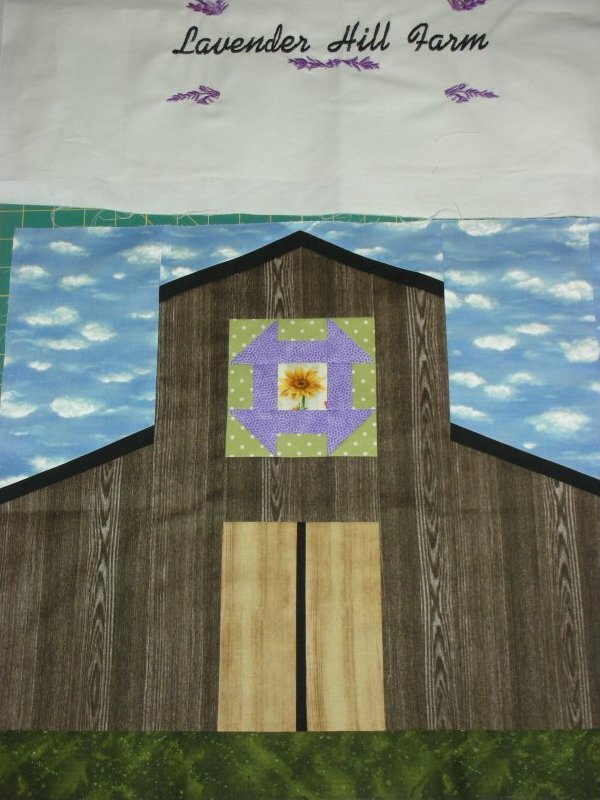 Thank you for bringing us this wonderful quilt that tells a delightful story of quilt blocks on American barns. 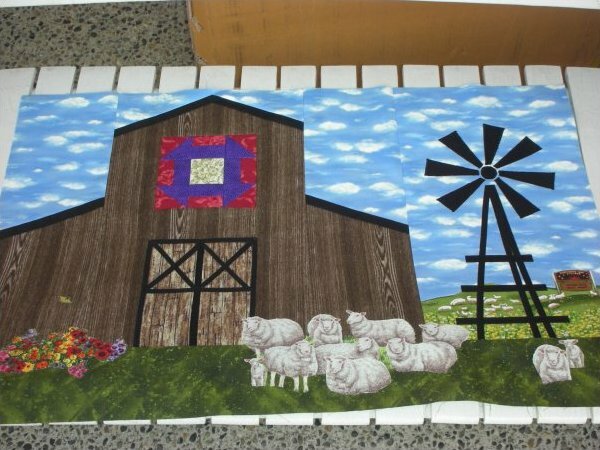 This quilt is our Saturday Sampler for 2011. This movement is progressive on blogs and websites too, read more. 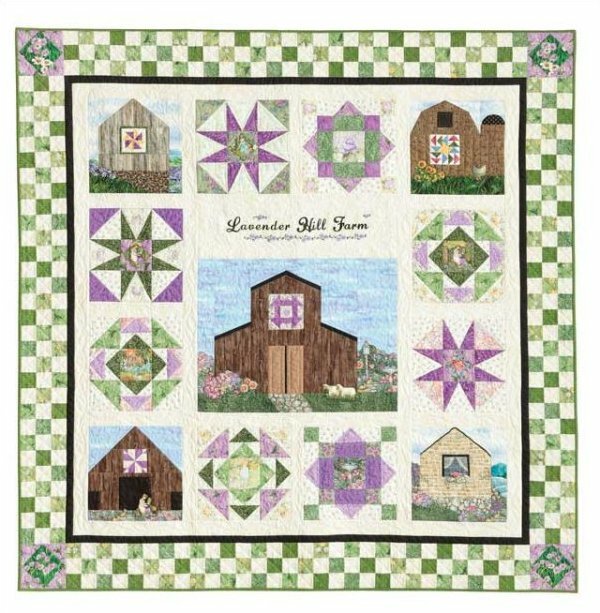 Our teaching book for this 2011 Saturday Sampler, Quilt Blocks on American Barns by Eleanor Burns and Quilt In A Day. This is the best blog ever! 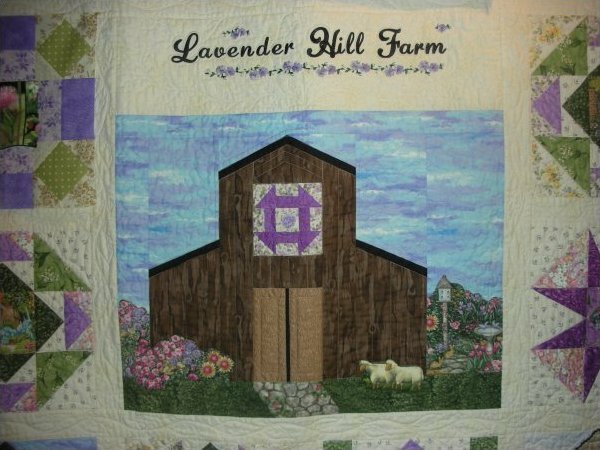 Photo's of the barns and the quilts and the stories are fantastic. Great job there! Use horses and animals in your blocks. August block is corn and beans. Careful piecing here. 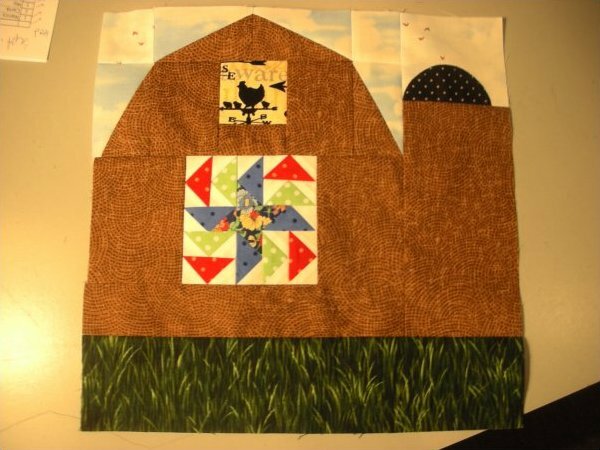 September Barn Block. Remember to add pigs, sheep and elements of your choosing. Octobers Block is Dora's Delight. January 2011 Broken Wheel Block. 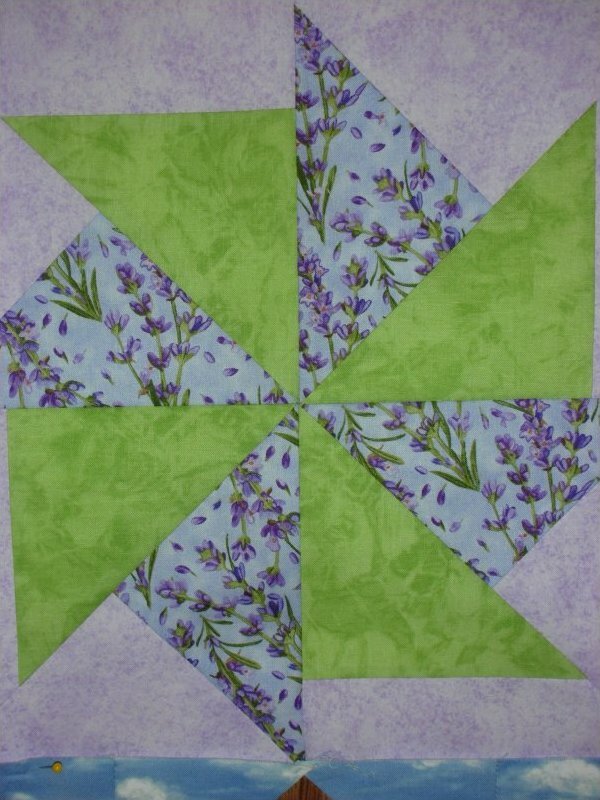 Embellish the center square with a lavander sprig. 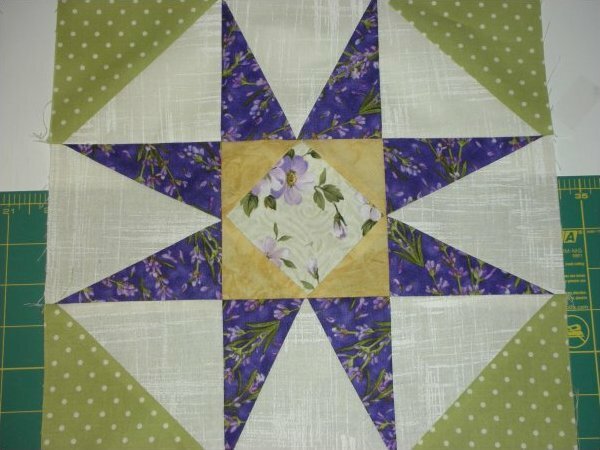 February Block is Quatrafoil. Fussy cut this block too to capture the bouquets. March is the Bank Barn. Add Animals. April is Hen and Chicks. Dark brown center can be substitued or anything different. May is Farmers Daughter Block. See how pretty she dances in there. 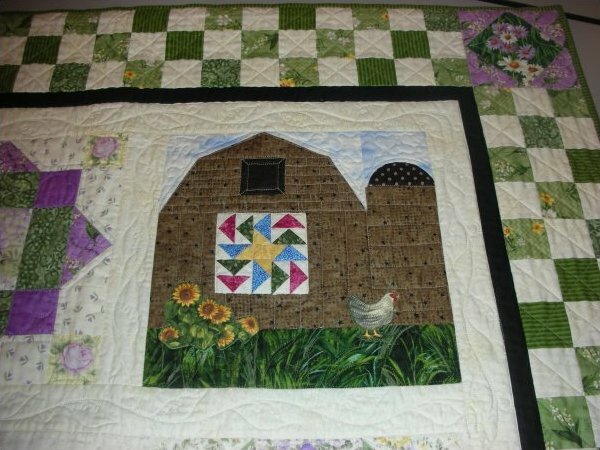 June Barn Block. Add animals and landscaping to your block. Sky and wood grains are directional. Visit Sequim, Washington, the Lavender Capital of North America™ to celebrate the 11th annual Sequim Lavender Festival, always the third full weekend in July, when the purple blossoms are bursting throughout the beautiful Sequim-Dungeness Valley. This three day festival is the largest lavender event in North America and features seven farms on tour with more than 100.000 plants, a juried Street Fair, and many exciting community events. The Eight Farms on Tour open their fields and their hearts to visitors, offering many lavender activities. Learn about lavender lore and how the herb is grown, harvested, and turned into dozens of different products using dried blossoms or steam-distilled lavender oil. Attend workshops, demonstration, horticultural programs, and “Meet the Farmer” sessions. Visitors can spend time in the fields, where lavender can be picked for bouquets to take home, and enjoy food, beverages, entertainment, and northwest crafts. Tickets are $15 and provide admission to all of the Eight Farms on Tour, with children 12 and under admitted free. There is plenty of free parking at all farms. Shuttle bus service, providing transportation between the Street Fair and each of the Eight Farms on Tour, is free with your farm tour ticket. The Street Fair in downtown Sequim anchors the festivities, with more than 150 juried craftspeople and vendors of lavender and other Olympic Peninsula specialties. Enjoy fine musical entertainment, great Northwest foods, and Olympic Peninsula wine tasting. There is no admission to the Street Fair and free parking in downtown Sequim. The entire valley celebrates with a variety of Community Events to entertain the whole family. 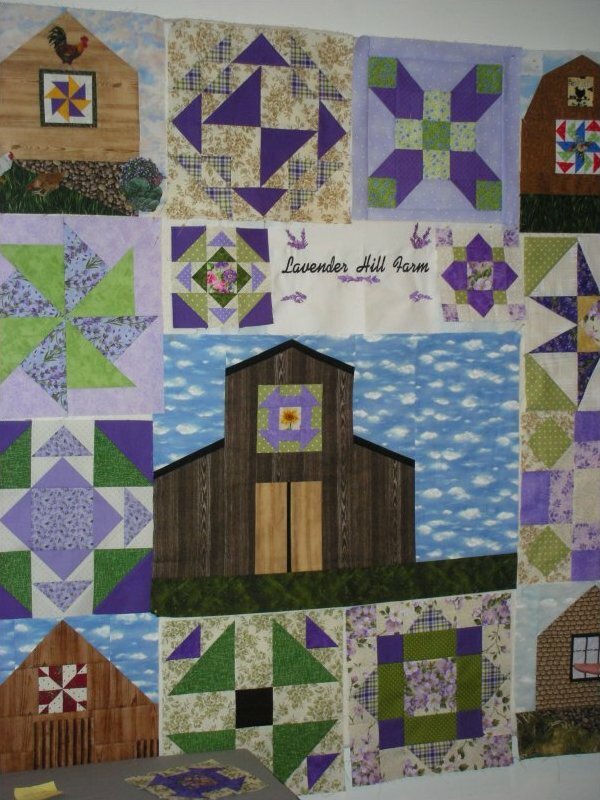 The 21st annual Sunbonnet Sue Quilt show will be held in conjunction with the festival again this year, as well as a salmon bake, barn dance, and North Olympic Peninsula Wine Tour. Take part in the Race for Lavender, golf tournament, and exciting new programs from the Dungeness River Audubon Society. For more information including transportation, accommodation’s, and directions please contact us by e-mail at info@lavenderfestival.com, website at www.lavenderfestival.com, or by telephone at (877) 681-3035 (toll free). The Festival is proudly sponsored by the Sequim Lavender Growers Association (SLGA), a community of farmers, committed to knowledge of how to grow better lavender with less effort in an environmentally sustainable way. The Festival is produced by Olympic Peninsula Community Celebrations. Both are Washington nonprofit corporations. Get on the Olympic Peninsula by Hwy 101 or ferries and head to Sequim, Washington State. Tickets $15 for 7 farms on tour, free street fair. This panel being offered by Essie or a fee. Please see the sample and inquire at the shop. All three blocks. 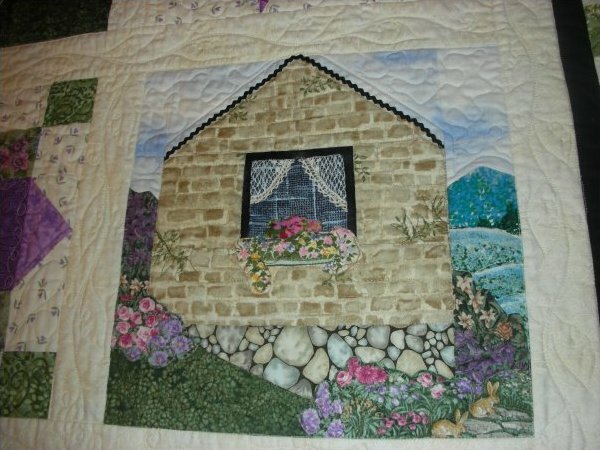 October, Dora's Delight and Monitor Barn Panel with Embroidered upper panel. Please think about how you would like your center to appear before you start this block. 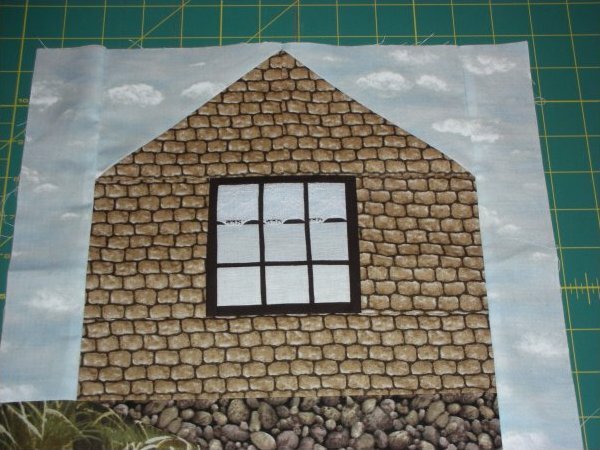 Note that there is extra sky fabric in this kit to take the sky one more inch at the top to give your center more depth. This will create a more landscape feeling. 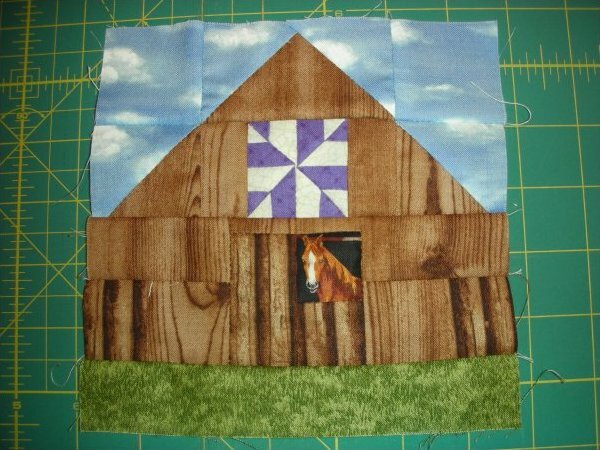 You can also balance or center your barn block to take some ground and sky off the right side and apply it to the left side. Once again, your barn is centered. Final dimension needs to be 18.5 x 26. 5. Likewise with your letter panel, it needs to be 8.5 x 26.5 inches long and centered. Here's where we can fix or remedy any blocks or panel pieces that are too short by dropping in a 6 inch block, extra sashing or a fussy cut panel. 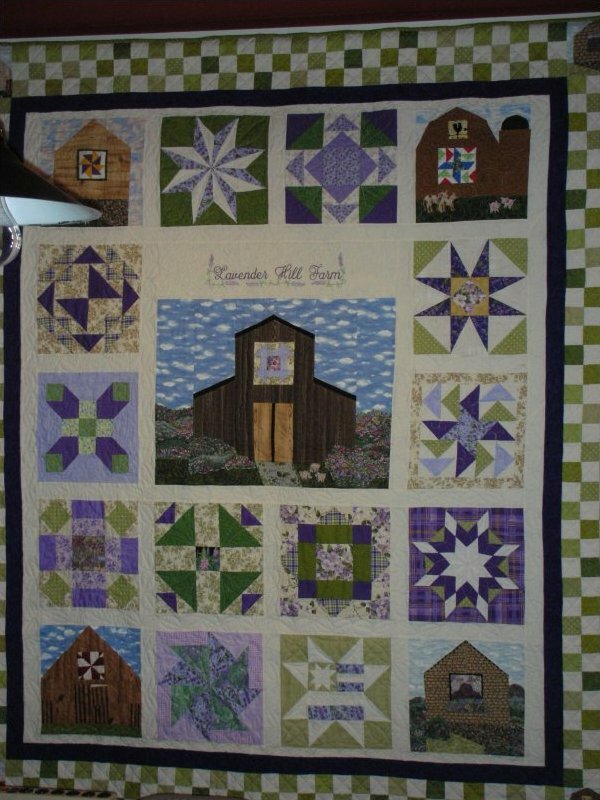 Come see and we will explain or refer to the picture of this quilt in the beginning of your book. Center your Monitor Barn. Leave sky at the top. Playing with block placement. Preparring for sashing. Not final. 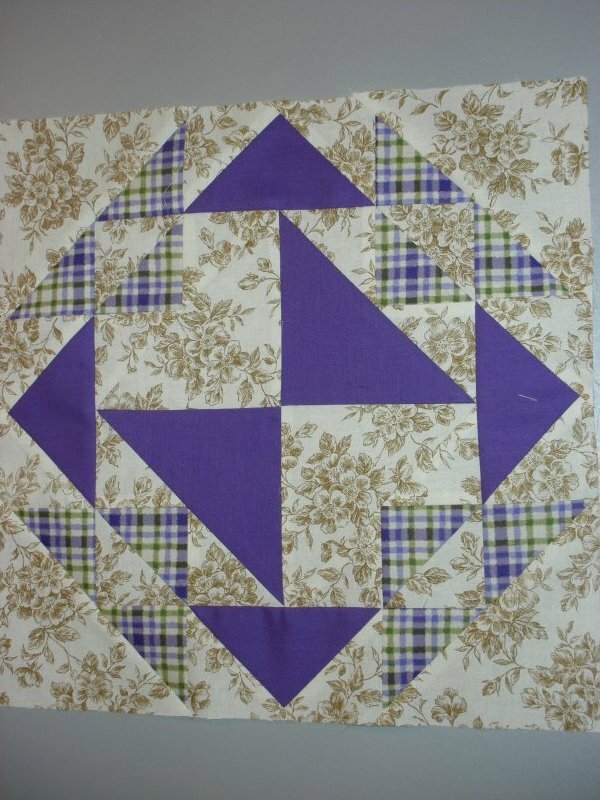 Thank you Quilters for sharing your blocks with us.